You are welcome on the web site of the Public organization "All-Russian Electric Trade Union". ARETU web site was established in April 2002 and upgraded in the years of 2006 and 2010. In 2017-2018 it has become more accessible, mobile and now it allows to quickly monitor any issue of interest and take into account the views of the largest possible number of union members when one needs to come to some decision. The renewed web site not only significantly increases the awareness of union members about the goals and objectives of the union, its territorial and primary organizations. It also shows what kinds of actions are undertaken by the trade union and its organizations in the field of protection of their members’ interests. The site of the All-Russian Electric Trade Union will allow any trade union worker and union member to quickly become familiar with the decisions made by its leading bodies, draft laws, legislative and regulatory acts, affecting the interests of workers in the electric-power industry, electrical and peat industries. If we met on our site, it means that you are an active trade union member, or a person, who is interested in the activities of our trade union and, quite possibly, in the near future, it might so happen that we will hand in to you a membership card, which means that “in our regiment” of people, who are ready to collectively defend interests of working people, there will be one active member more. We hope that the site will not only help you get to know our union, its activities and concerns, but will also help you to find answers to some legal, organizational and other issues that may arise. We are waiting for you on our site - the site of like-minded people, who have dedicated themselves to the protection of the interests of working people and, we hope that the site will provide you and us with real assistance in this noble cause! The Public organization “All-Russian Electric Trade Union” (ARETU) has been established on December 3rd, 1990. ARETU is the all-Russian trade union, a non-profit corporate organization, operating on the territory of the majority of constituent entities of the Russian Federation. The trade union unites on a voluntary basis Russian citizens - trade union members, who work in organizations engaged in production, transmission and distribution of electric and thermal energy, production of electrical machines and electrical equipment; other organizations related to production and sharing professional interests; entities of any organizational, legal forms and forms of ownership; non-working pensioners of these organizations, as well as teachers and students of professional educational institutions, dealing with social and labor relations, representation and protection of social and labor rights and interests of their members to employers and their associations, as well as in local government and state authorities. The English version of the full name is: Public organization “All-Russian Electric Trade Union” (ARETU in brief). In accordance with the Charter, the goals and objectives of the trade union are identification, representation and protection of social and labor rights and interests of its members, participation in formation and implementation of social programs for ensuring decent standards of living and favorable working and living conditions for the trade union members and their families. 10. Training and professional development of trade union workers, activists and trade union members, development of measures for their social protection, as well as development of proposals for elimination of violations committed by employers, their associations, executive authorities of the Russian Federation, etc. and bringing cases to court in accordance with the existing legislation. Improving and perfection of the existing structure, development of TU democracy, strengthening of the executive and financial discipline. 12. Cultural and educative work, informative and agitating work, conducting youth and gender policies, cooperation with other trade unions and TU associations with the purpose of defending of social and labor rights and interests of TU members, attraction of young representatives to the TU activities, education of young TU activists, etc. Born on June 18th, 1961 in Bryansk region. Higher education. Married, two grown-up children. In 1979 Yury Ofitserov acquired profession of turner at the Bryansk City Technical. In 1984 he graduated from the Bryansk Institute of Technology with a degree in forestry engineering. He began his career in August 1984 as head of the editorial department of the regional newspaper. Since 1993 Yury worked as head of the sector of ecology, information, public relations and mass media of Joint Stock Company “Bryanskenergo”. In 1995 he was elected as president of the Bryansk Regional Committee of All-Russian Electric Trade Union. In the year of 2004 he underwent professional retraining at the Academy of Labor and Social Relations in the field of regulating of social and labor relations, specializing in management of social sphere. 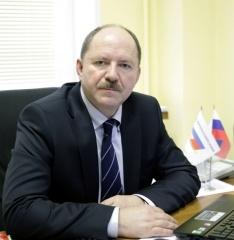 In December 2005, at the 1st plenary session of All-Russian Committee of All-Russian Electric Trade Union, Yury Ofitserov was elected as Vice-president of the Public Association “All-Russian Electric Trade Union”. After that he was re-elected to this position twice. On August 23rd, 2018 at the 7th (Extraordinary) ARETU Congress, Yury Ofitserov was elected as the President of the All-Russian Electric Trade Union. He is a member of the Executive Committee and of the General Council of the Federation of Independent Trade Unions of Russia. - Honorary diploma from the Ministry of Energy of Russia. Born on December 22nd, 1973 in the town of Perm in a family of a military man. In 1991 Alexander graduated from a secondary school in Krasnoyarsk region and same year entered the Perm Military Institute of Rocket Forces. In 1996 he graduated from the institute in the speciality of “Engineer of automated control systems”, qualification – engineer, military rank - lieutenant. From 1996 to 2002 Alexander served in a military unit of Krasnoyarsk region and was awarded with a medal “For distinctions in military service” of the III degree by the Minister of Defense of Russian Federation. In the period from 2001 to 2004, he received a second higher education at Saint-Petersburg Academy of Management and Economics with a degree in State and Municipal Management. In May 2002, in the result of the reduction of the Strategic Missile Forces division, Alexander Murushkin was dismissed from the armed forces of the Russian Federation in the military rank of a captain. From July 2002 to September 2010, he had been working at the branch of the “Krasnoyarsk Heating Network” of Joint-stock company “Yenisei Territorial Generating company (TGC-13)” as a deputy director for security and control. In May 2005 he was elected as president of the trade union committee. 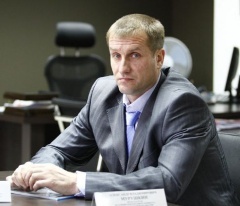 In September of 2010 and 2015 Alexander was elected to the position of a president of Krasnoyarsk regional organization of the Public Association – “All-Russian Electric Trade Union”. Alexander Murushkin is a member of ARETU Central committee since 2010 and a member of ARETU Presidium since April 2014. Alexander is awarded with honored diplomas of Joint-stock company “Krasnoyarskenergo”, Krasnoyarsk ARETU regional organization, Federation of Krasnoyarsk regional trade unions, ARETU Central Committee and All-Russian Electric Trade Union. On August 23rd, 2018 at the 7th (Extraordinary) Congress, he was elected as Vice-president of the All-Russian Electric Trade Union. A. Murushkin has a sports title "Candidate of Master of Sports of the USSR in volleyball." He is married, his son is a student, and his daughter is a pupil of a secondary school.